"The Cuban government is based on lies and cheap propaganda. That is why it is afraid of words and the truth." 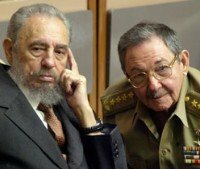 "El Gobierno cubano se basa en la mentira y en la propaganda barata. Por eso le tiene miedo a la palabra, a la verdad"
Raul Rivero, April 2006, University of Sevilla, Spain. Click on the buttons below to get the news feed you want. Note that most are in Spanish. English Language News feeds are indicated by (En). Promulgated in February 1999, the "88 Law" – soon nicknamed the "gagging law" in dissident circles – weighs like the Sword of Damocles over any person who "collaborates, by any means whatsoever, with radio or television programmes, magazines or any other foreign media" or "provides information" considered likely to serve US policy. The law provides for very heavy sentences: up to 20 years' imprisonment, confiscation of all personal belongings and fines up to 100,000 pesos (close to 4,800 dollars, while the average Cuban salary is 250 pesos or 12 dollars per month). This law, that no court has taken advantage of as yet, also provides for punishment for "the promotion, organisation or encouragement of, or the participation in meetings or demonstrations.